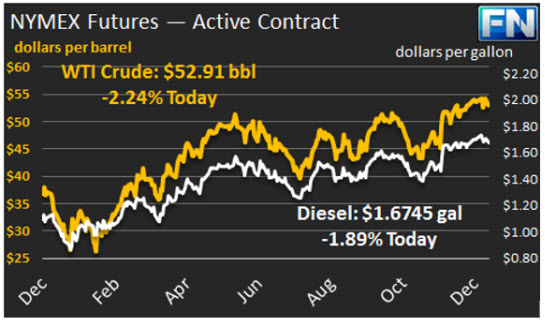 WTI crude prices fell steeply this morning, and are currently below $53/b. 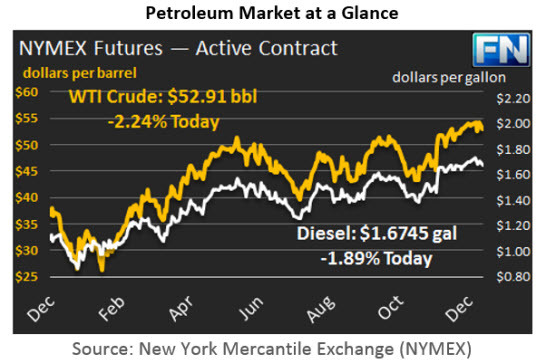 WTI opened at $53.75/b today, two cents above Friday’s opening price. Friday’s market closed at $53.99/b. Prices have fallen steeply since then. Current prices are $52.91/b, $1.08 below Friday’s close. Product prices have dropped, following crude prices. The sell-off is likely based on fears of expanded supply. On Friday, Baker Hughes released its rig count data, which showed that the U.S. active rig count added 7 rigs during the week. This was the eighth week in a row that the U.S. rig count increased, as U.S. producers move to take advantage of the higher prices forecast for 2017. This morning, Reuters reported that Iran appears to have sold over 13 million barrels of oil that it has held in floating storage. The data cited was from Thomson Reuters Oil Flows, which showed that the amount of oil in Iranian floating storage fell from 29.6 million barrels to 16.4 million barrels. The buyer(s) are not clear, but past Iranian sales have focused on Asia. Distillate opened at $1.7011/gallon in today’s session. This was 0.4 cents above Friday’s opening price. Friday’s market closed at $1.7032/gallon. Current prices are $1.6745/gallon, down 2.87 cents. RBOB opened at $1.6297/gallon today, down 0.94 cents from Friday’s opening. Prices weakened slightly on Friday, closing at $1.634/gallon. RBOB prices have continued to drop in today’s early trading, and are currently $1.6045/gallon, 2.95 cents below Friday’s close. Gasoline prices have been volatile in PADD 5 because of unplanned outages at PBF Energy’s Torrance refinery and Phillips 66’s Wilmington refinery. Gasoline volatility is possible today in parts of PADD 1 because of Sunday’s closure of Colonial Pipeline Line 19 near Chattanooga, Tennessee. It is unknown how long the line will be closed, but its closure affects the Nashville market. Additional details are provided in our second article today. Mansfield Supply will continue to monitor the situation and keep customers informed.